Designing Engaging Experiences: What Does It Entail? This strategic & innovative work is perfect for the hotel struggling to differentiate in the “sea of sameness”. All businesses can afford to be more imaginative about the resources available to them. Hospitality will always be about experiences and connecting to people, but today’s competitive landscape requires us to go one step further. The good news is, there isn’t just one way to go about customer experience for your hotel. You can find the approach that works for you and your customers. And the path has already been established by the leaders such as Disney and the Four Seasons. But now it’s time for the independent hotelier to embrace these same strategies. If you’re open to start selling experiences over rooms and reimagine your hotel beyond heads and beds, then keep reading! Guest engagement and delivering memorable experiences comes in all shapes and sizes. 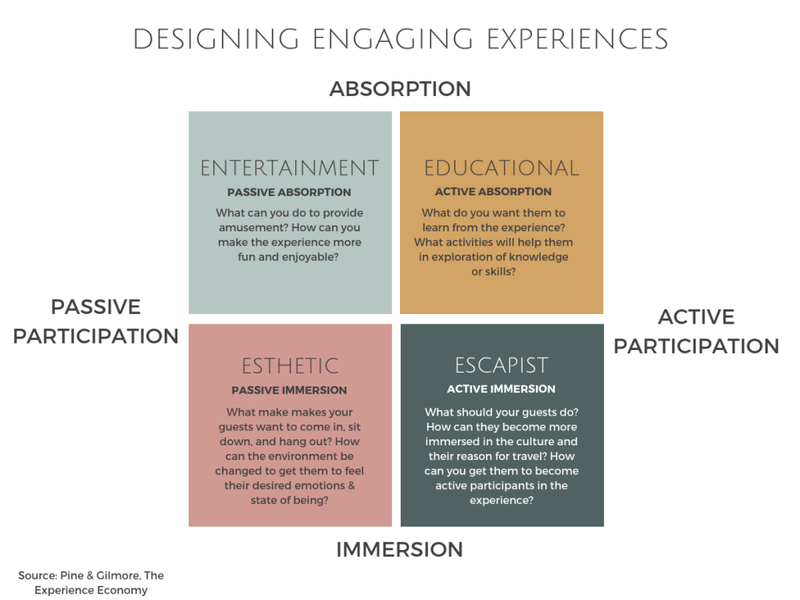 As you will see in the chart above, experiences range from passive to active absorption and immersion: Entertainment, education, and escapist. It’s your job as the hotel to be the direct portal into the local scene that spells the difference between just visiting a place, and really being there. While offering all three types of experiences is ideal, we will uncover which levels of engagement is best for your hotel based on your customers and your brand. The innovative, customer-driven independent hotel has many opportunities to surprise & delight guests looking for a more purposeful way to engage the local scene & culture! When you engage all 5 senses of your guest, they will experience certain moods and emotions. The question you want to ask yourself is: what is your environment making your customers feel now? People are sensitive to the small cues that they encounter through their sense of sight, touch, hearing, taste, and smell. Travelers look to the hotel to be inspired, energized, productive, or to relax at the times when they need it. Rooms with personality and even ‘themes’ engage your guests and offer a chance to suspend reality. To try on new identities. To facilitate exploration and try on exciting lifestyles. And on top of that, we must keep in mind that people are traveling because they want to see and experience the region they are visiting. This means incorporating authentic cultural cues that express a sense of place. How Can We Work Together To Elevate Your Customer Experience? Does this require a complete remodel? Or bringing in a completely new team? Not at all. Meaning and positive emotion can be derived from a variety of thoughtful details that don’t have to break the budget. And collaboration will open up so many doors in terms of keeping your guests engaged & entertained. When environment and entertainment are both on point, you will achieve your guest’s desired mindset and win them over forever. With some help, you can become your customer's favorite place to stay and play! Your brand has a word-of-mouth-worthy angle that can be used to your advantage. When we get to the heart of your mission & values, we can determine your brand’s why. Your unique selling proposition combined with your brand will help us form a distinct marketing promise that resonates with your dream customer and guides your business effortlessly to success. Are you attracting high-value dream customers? Once you have a strong and memorable position in the marketplace, only then can you determine which consumer segments are most responsive to your brand’s positioning. Instead of looking at just demographics, we have to dig deep into what drives the different types of people out there, from their motivations & values to their desires. Which needs for belonging, esteem, and self-actualization does your brand fulfill? From there, we can begin to look at the consistencies and common threads amongst the target market’s passions, likes/dislikes, personality, behaviors, and expectations. Experience design is about asking, what do customers want and how can I give it to them in the most exciting, unique way possible? What are the emotions, meanings, and memories that we want them to take away and feel during every moment of the experience? Consumers derive value from entertainment, education, pleasing aesthetics & sights, escapist/immersive activities, and tangible takeaways. We’ll determine where the customer expectations lie and how to go above and beyond to surprise & delight! We will take a creative look at how authentic, curated details and touchpoints that engage the senses can deliver on your brand promise. In some instances, we will look at how trends, nostalgia, and psychological motivators such as exclusivity can be leveraged. And we’ll make sure that the experience aligns with your positioning and customer’s desires throughout the entire customer journey. The human brain loves stories, and yet most marketing messaging is haphazard and uninspired. When you have your positioning, segmenting, and experience design aligned, storytelling comes easy. It’s all about painting a picture of the “current” state of your customer and the desired “after” state that your experience delivers to transform them. This requires using the right language and words for your brand’s personality that get your dream customer excited. But not just that: storytelling to achieve your goals is all about sharing the key elements & points that the potential customer needs to hear in order to feel aligned with the brand and moved to action/purchase. You will come away with a story and creative marketing campaign that pulls people in and keeps them hooked!